Well, here I am again at 4:33 a.m. in the morning, sometimes I just have to get out of bed and start sharing. I had to drag myself out of the kitchen, after the tea water was ready. “I am not putting away dishes now, this is time to write and be creative in.” This is what I was saying to myself, as I walked out of the kitchen, then I saw the cat vomit on the floor, cleaned that up, and now I’m sitting at the computer. My tea is next to me. I don’t really know where to begin, at least not without crying. For the past few days, I’ve been mostly in the body of a little boy who was in a head-on collision with his dad. His name is Chase Jesiah and he has a gorgeous smile and beautiful eyes. Jesiah comes with his grandmother to services I lead at our congregation. My services are always open to children, but most kids don’t feel too inclined to do that kind of thing. He always gives me hugs and thanks me and enriches anything I am doing. He will be okay, I believe this with all my heart. He’s been in Oakland at the children’s hospital there and has had lots of surgeries and doctors and nurses and family around him. He’s also surrounded by the prayers of our community and all the angels I can send his way. His father, Wade, is in critical condition and at another hospital in Santa Rosa and will need a solid year most likely of recovery from his injuries. His father has not been surrounded just by loving kindness, but by judgments and difficulty. He is suffering also. I have only ever known Wade as a kind presence at his mother’s side at the funeral of his grandmother, Jesiah’s great grandmother, or when he has come to a service to pick up his son. I know the grandmother Hadasah best, because she has been a member of our congregation for years and years. Anyone reading this can just imagine the horror of all of this for the entire family and community. Everything else pales in comparison. I also do not know the outcomes for any of the other folks injured in this collision. I have been completely focused on praying for Wade and Jesiah and their family. I’ve also been tending to my husband post his minor surgery and dealing with my own body’s exhaustion, post traveling to DC and helping my daughter recover from her third surgery which happened right before Passover. Then there was making Passover happen, then before that going back eleven months there has been a steady stream of accidents, deaths, financial challenges, friends and family in tremendous pain, illness, confusion and suffering, folks getting divorces, cancer, losing homes and hope. It’s been a really long and hard period of time, a marathon really of epic proportions. I keep asking the Holy One, when will this stop, when will there be a break? Apparently the answer to that question is: There won’t be. So, how does one run a marathon? At full speed all the time, nope I know that doesn’t work. Slow and steady the whole time, well life isn’t like that, sometimes you have to really extend and work super hard to help folks or deal with something and you can’t be slow and steady. Stopping and starting, will that work? No, that doesn’t work either, at least not when it is a race, but I think some combination of all of these are how I am navigating this. And, I’m not running this particular marathon by myself. Everywhere around me is a throng of bodies in motion. We are all running, aiming towards the finish line, hoping it is coming soon, but the rules of this particular jaunt dictate that the finish line keeps being moved. I really just want to curl up under a tree next to a river and not encounter another human being for a VERY long time. I want to cry and sleep and read and swim and watch the fish meander about. 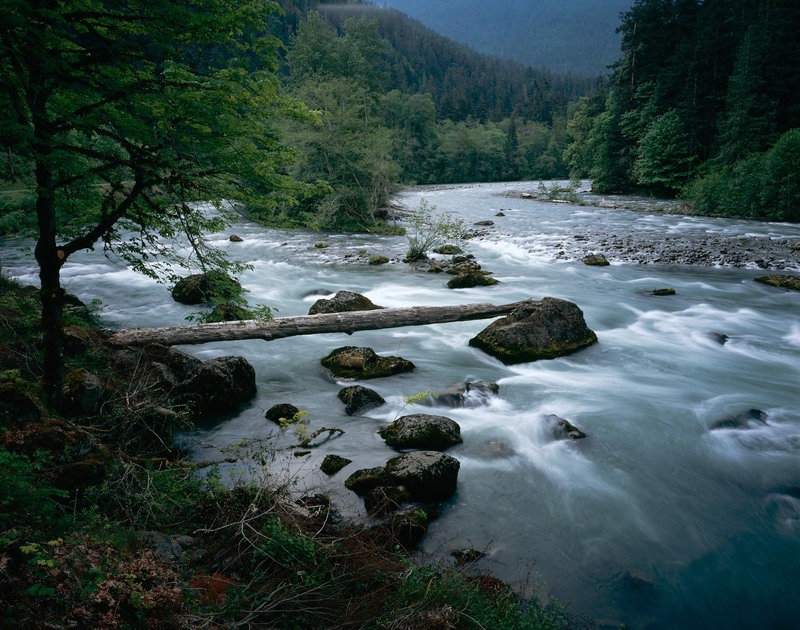 I want to listen to the sound of the water as it rushes past the rocks and the wind as it moves gently through the trees. I want to make stick and stone sculptures with whatever is at hand. I want to pray and never stop and not be interrupted. I want to feel the angels that are near me and just be with them in light and praise of the incredible gorgeous beauty of the Holy One and the Creation. At least for this moment I can do that in my mind. I also just want EVERYONE I know and love and encounter everywhere to get it that they are loved and held by the Holy One. I don’t care if they are atheists or scientists or even if they actually belong to a religious community. I just feel that if people could actually see and feel the presence of wonder and holiness everything would be so much better for them. Duh!, but for some reason folks don’t see or feel the Grace and Beauty and Wonder that I do. And I cannot make them feel that, no matter how hard I try. I want to so bad, I want to just be like a magic fairy that waves her wand and makes everything appear golden and laced with mist and jewels and dew so that folks stop their angry responses and their despondency and their criticisms of self and others melts like butter in the sun. I feel like I am the luckiest woman in the world. I have so much goodness and love in my life and even though I am tired and I want a break from all the beautiful people I love and who love me, I still am grateful for them and for all their unfoldings. So, tonight I will lead a healing circle for Jesiah and Wade, for all the folks in our community who have people to pray for, not just these two folks, but lots of others as well. We will imagine all those we love filled with light and being held by our love and prayers and by the angel of healing Raphael. Then I will lay all of my wishing and wanting down and I will light Shabbat candles and usher in 27 hours of PURE MAGIC. It’s my time of prayer and sitting by the river in my heart and just not asking for anything, of trusting and reconnecting with all that is good and right in the world, because along with all the hard stuff, there is soooooooooooooo much that is good and right in the world. Between now and then, I need to get some sleep, cook some food for the potluck meal at the Temple tonight, deal with my desk, plan the service I am leading, try and get a swim in and if I’m lucky have a few moments to just sit on my deck and enjoy the flowers. If I don’t get to that part today, for sure I will tomorrow, since this marathon mama does no running on Shabbat! 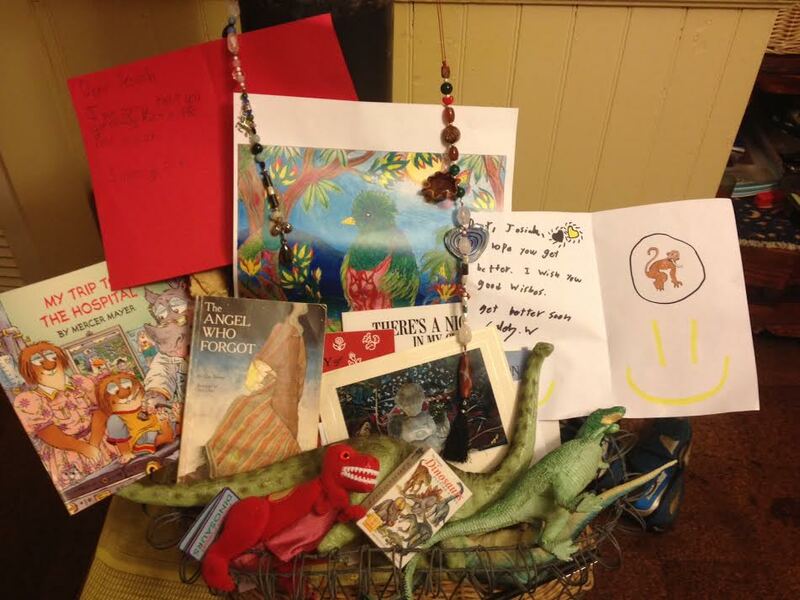 Here is the basket of goodies and cards that includes the chain of beads we prayed over and made to send to Jesiah and Wade. beautiful, heartfelt, optimistic, hopeful, loving, compassionate, blessed and kind. These are the words, thoughts, feelings that come to me after reading your bog.